For several weeks I have been trying to avoid working on the sideways tree since it affects my allergies. Having a temp of -5 also might have contributed to me staying home, but only a little. Since so many of the trees in this wooded area are elderly and falling down, I have been looking for ways to encourage new growth. Not only does it look nice, but I am hoping it will keep the hillside from eroding. Winter is the wrong time of year for seed production, so I haven’t been able to harvest any fallen ones…except for these guys. I borrowed this picture from Tree Pictures Online.com . Like a lot of people, I mistook the trees for maples and attributed these nasty seed pods on the ground to some other source. Turns out they are from a plant that wears a lot of names. 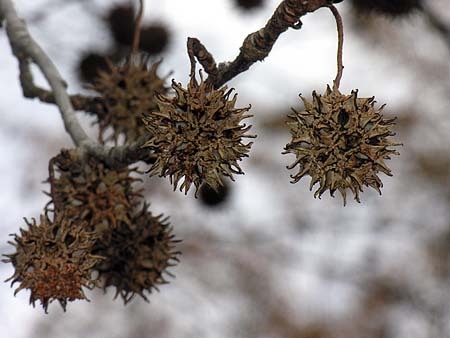 Around here they are called Sweet Gum, but they can also be called Liquidambar, Storax or Alligatorwood. They are often used in reforestation projects because they grow quickly. There is an abundance of these seed pods on a neighboring street, so Toby and I have been gathering them up on our walks. We take them to the area around the fallen tree and lob them into the woods. To be honest, I have no idea if the pods have viable seeds or not, but I still fee like I am helping to bring the possibility of new life to the area. These seed pods are so strong and spiky that they can be used around the garden to discourage interlopers. They are hard enough that you can puncture a tire if you run over them. By now, Toby and I must have tossed a couple hundred of these pods into woods. If nothing else, maybe they will discourage some of the animals that travel the pipeline up into out back yards. Aagh! Avoid the spiky seed pods! The weather may have warmed up a bit, but we know it is temporary. Come visit my shop and pick out your favorite quilt (on sale!) to help you keep warm when the regular February weather returns.